Long before PJ Powers (born Penelope Jane Dunlop in Durban, 16 July 1960) became Thandeka (the loved one)or achieved a UK chart hit with World In Union (with Ladysmith Black Mambazo) in 1995, she was the lead singer for top South African rock band Hotline, who formed in Johannesburg in 1980. PJ Powers came from an all-girl group from Durban called Pantha. Pantha was formed in 1979. We had a fairly good run but being anall girl group in the shadow of Clout,we never managed to secure a record deal.P.J. Powers was the fronting singer then known as Penelope Jane Dunlop. 'You're So Good To Me' was an SA #8 in February 1982, backed by 'So Cold'. 'So Cold' is one of myall-time great magic moments in SA Rock - stunning vocals, driving bass-line... this track rocks, man! 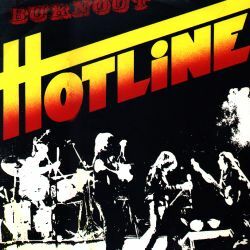 The title track for 'Burnout' actually only appeared on their second album 'Help' in 1982. The band changed their style to afro-rock in 1983 and went onto even bigger things, like overseas tours.PJ Powers and Hotline released a greatest hits album which is available on CD.